With photo framing, you can hone in on a photo in order to get a nice tight view that can make an area seem more sprawling or massive than it really is. 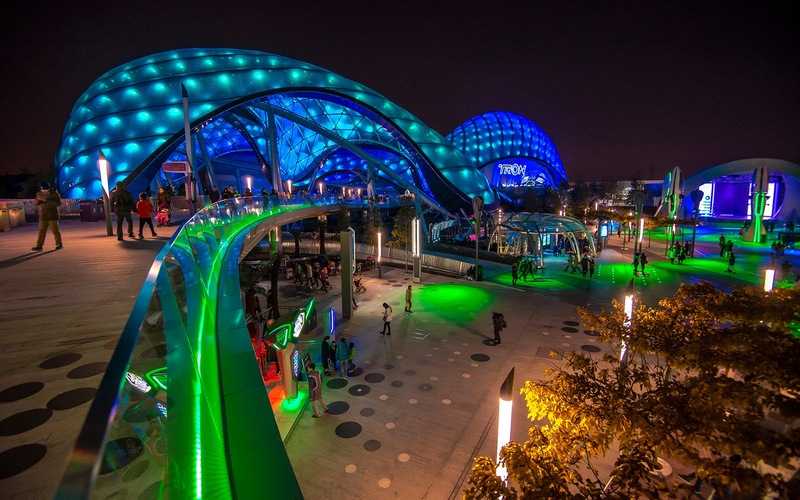 At Shanghai Disneyland's Tomorrowland there's one main view that is a pretty popular target for photographers and also helps heighten the scale of this land of the future. Most photos of the show building for TRON Lightcycle Power Run give Tomorrowland a feeling of endless expanse, but in reality, the area is much smaller than imagined. The shot below shows off most of the attractions, with only a Star Wars Launch bay on the lower level to the left and the Jet Packs spinning rocket attraction behind this angle rounding out the land. You can actually see that beyond the building itself, there's not much more in terms of spatial forms within Tomorrowland. But what's present is most certainly impressive, and this angle makes for an incredibly great photo. Another glowing and colorful scene from Shanghai's Tomorrowland!